Some folks determine to use technology for GOOD! Safety is the priority at beeSAFE - and I have learned so much about "bee"ing safe working with them... Thank you for putting your energy into applications that help familys stay in touch during emergencies! I would not be surprised if by next year - beeSAFE is in the Top 100 Android Applications! You are on a road trip that requires multiple days of driving. Using Trip Track, you can keep a log of your driving distances. You can then email people the kml files to people or show them them your entire trip using the BeeSafe™ view trip function. Each file or distance traveled will have another color, so you can see your distance every day as well as the total trip. While traveling to visit family, a SEVERE storm pops up. Your family is watching the news and realizes you are in the middle of a potentially life threatening situation. With our status update, you can email a family member the Google Map link with your GPS location. Or you can call, text, or email your ICE contacts to let them know you are safe and your location. tire. You look around but don't have any idea where you are at. There are no signs or markers. 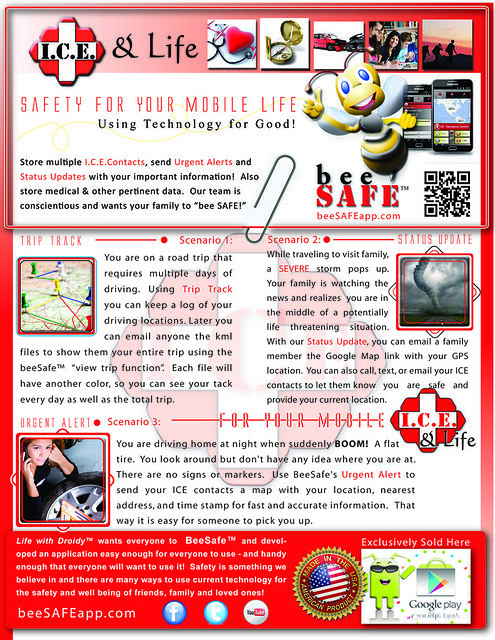 Use BeeSafe's Urgent Alert to send your ICE contacts a map with your location, nearest address, and time stamp for fast and accurate information. That way it is easy for someone to pick you up. We at Life with Droidy™ are conscientious people that believe everybody needs as much help staying safe in this modern age, and knowledge is power. Thus, we developed BeeSafe™, an all purpose application for everyday use. Store you ICE contacts, Medical Information, and other important data select send options for your ICE contacts which are email, sms, or both. Click on ICE contact to call them. Using the phone's GPS, your location is shown on Google Maps in the application. Trip Track saves all your GPS points and saves them in an .kml file which can be opened using Google Earth or in BeeSafe™. This shows the path you took from the moment Trip Track was enable until it was disabled. Options tab allows you to store the information related to this program on your SD card instead of using your phone storage. You can password protect your ICE Data, so that editing data requires your password. We provide a walk-through for BeeSafe™, so you can get the most out of our app. It is hosted on our forum or click how to use. We will be posting a YouTube videos explaining how to use the features of BeeSafe™ in the future. All permissions required for BeeSafe™ and their purposes. Reason: Tracks the user location for urgent alert messages and status updates including closest address found based on last known location. Also used to record trips when user starts triptrack. Reason: Allows users to select someone from their contacts to send a status update to as well as giving auto complete functionality to users when entering new emergency contacts. Reason: Tracks network connectivity to see if urgent status can be sent when urgent button is pressed. Used to send urgent emails to contacts and for facebook and twitter social networking. Reason: Saves trips and ICE info to the sd card. ice info can be stored on internal memory as well. Reason: Send urgent alert to people who have sms checked in emergency contacts. Reason: Gets users phone number so that they can perform test alerts to verify their user data. Reason: Vibrates when you get a GPS lock. I don't have a smart phone (yet) but when I do ... I am going to get this mobile app!